Amazon Alexa is a digital assistant set to revolutionize the way we used to get information and control our homes or office spaces. Undoubtedly, these voice-enabled and artificial intelligence integrated devices altered the way in which we used to interact with machines. Nevertheless, in reality, we are just scratching the surface of Amazon Alexa, unknown of the hidden potential these voice-activated intelligent devices have. As Amazon has handed over its Alexa Skill kit to developers, it will be stupefying to see what Amazon Echo, Echo Dot, and Tap could do beyond some silly voice tricks. With each day new skills being added to the Alexa Skill Store, we could see the amazing difference it is making in the day-to-day business operations. 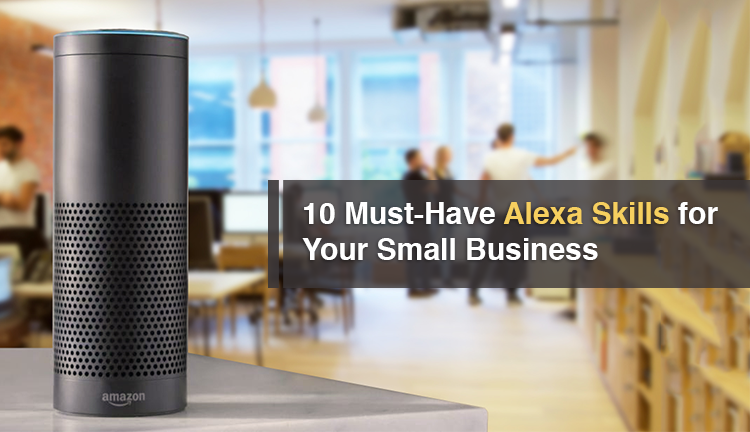 It does not matter, whether you have a small or medium-sized business, getting Alexa skills developed to streamline your business operations and bring agility into the workplace is the preliminary need of the hour. If you are unaware of the Alexa Skills you can utilize to boost the productivity of your small business, here are a few suggestions. Alexa is fairly clever about the to-do list commands. You can be far more precise to create skills that suit your business. For instance, when you say, “Add” an item to a list, (Example: “Alexa add 4:00 o clock appointment with Mr. XYZ to my calendar”) Alexa immediately understands your speech request, converts it to a to-do or as a scheduled event for the day, and sends you a notification about the added event in your list. If you are speaking about an event, task or an item, just nature, and name of the product you want to add in the to-do list determine the type of to-do list in which the particular product or item will be added. The best part is you can access your to-do list within the Amazon Alexa App on Android, on iOS, or by visiting alexa.amazon.com. This Alexa skill is very much important for businesses and their employees who are either frequent fliers or need to travel a lot for their business. Opposed to the common swipe of an app, Alexa skills let users interact in their natural language to plan and book a travel or to access critical travel alerts like flight delays, gate changes, and reservation cancellations. Customizing the skill further and integrating weather updates, seat maps, and driving directions to move from one point to another is the best option to enhance Alexa skill for managing and tracking the travel itineraries. Although, you can book a cab using Alexa Skill developed by different cab service providers, adding a skill to rent a car at new locations helps in effort reduction and time-saving. Conferences play an important role in the business processes, when you have Alexa skills ready to manage your conferences then you definitely have a tool that will boost the productivity of your small business. Using this Skill, you can easily join a meeting. In order to reduce the complexity for users in joining meetings, you can integrate the most vital components of a conference like dialers, remote controllers, one-touch or single-click in mobile apps and meeting room displays into Alexa Skills, The inbuilt AI smartens up the conference rooms and its proceedings to a great extent. With Custom Alexa Skill managing Conferences, you can join meetings using the pre-populated PSTN numbers provided by the third-party conferencing service provider and schedule meetings based on the user’s calendar and resources (rooms) available in the office building. An integrated Alexa Skill that can work with all types of calendars and contact providers whether personal or corporate across all organizational boundaries is must have for your business. Many people have different calendars, one at work, one at home, and one for games, if you also have similar calendars, you need to create a custom Alexa Skill that will integrate all these calendars and presents a unified view of all your contacts. Using this skill, you can ask Alexa about the availability of a particular person in your contact list. You keep a track of your daily schedules, have lunch at a time and keep free time for a meeting tomorrow. Having known availability of key persons in your contact list, you can ask Alexa to schedule events, meetings, calls, and conferences ensuring maximum productivity in minimum time. 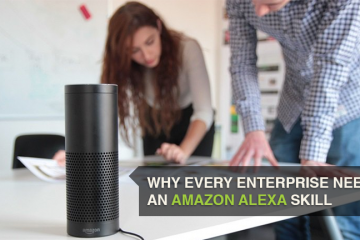 ALSO READ: WHY EVERY ENTERPRISE NEEDS AN AMAZON ALEXA SKILL? Customized Alexa Skill offering high quality and frequently updated creative content that relates to the products or services you are offering help in enhancing relationships with the consumers. After analyzing the market, hearing the customers, and understanding their needs you can create Alexa Skills that are intended to offer something of value to them. Such Skill helps in maintaining the consistency and voice tone of your brand. Personalized and customized Alexa Skills with a proper call to action feature has helped businesses in boosting productivity and profitability of their businesses. Thus, an Amazon Alexa skill, especially dedicated to market your product or service through interesting voice content is a must-have Alexa Skill for your business. Inventory management is one of the biggest hustle faced by smaller businesses. Although you have an option to use spreadsheets and databases, keep track of quantities of each item in the inventory, but you cannot access this data anywhere and at any time. Consider developing an Alexa Skill that incorporates voice-activated inventory management. The digital voice assistant is revolutionizing the way we do business and a custom Alexa Skill is offering a solution to the business owner to access information anywhere and at any time with voice commands. Moreover, the Alexa Skill does not display the inventory reports, but it reads those reports or that information for you. Alexa Skill developed to manage your tasks is an incredible way to increase business productivity. The skill utilizing voice recognition to add items or tasks to your to-do list eliminates the need to reach for your smartphone. Seamlessly synchronizing existing task management application with the Alexa Skill or making it compatible with multiple such applications helps in increasing your own productivity and helping you to stay organized. The Alexa will automatically add tasks or events to your to-do list, any item, event or task you edit, complete or delete will automatically update your to-do list. No wonder, Amazon Alexa with its hidden potential and artificial intelligence can be used to keep track of finances and to manage money. An Amazon Alexa Skill that can be used to see what bills need to be paid, the status of your budget in accordance with the set financial goals, the money you have to reach the desired goals, to analyze and control your spending. Alexa is more than just the voice of your bank account, as it also provides advice based on your existing bank and financial data, so you can control your finances more efficiently. Amazon is planning to sell its virtual assistant Alexa, as a cloud-based service to retail call centers. AWS has already started to pitch the services to the insurance and healthcare industry. With an improved contextual awareness, Amazon Alexa Skill customized to help customers might prove to be an excellent option to offer customer support. Depending on your products and services, you can think of developing Alexa Skills that are mature enough to address customer issues. One of the main objectives of this skill is to demonstrate the creation of a service call for the given product details. The skill is developed in a manner to understand the issues faced by customers and create a service request in the backend system with provided details. Not only it helps businesses to offer out 0f the box customer service, but it also helps them in reducing response time thereby attaining complete customer satisfaction leading to customer retention. Amazon launched Alexa with a vision and that particular vision has been realized. These days, everyone wants to control everything in his or her homes with voice commands. Having developed Alexa skill can help to monitor, manage, track home and office equipment that adds a layer of simplicity and elegance to the smart home and smart office category. There are multiple devices or smart equipment that you can manage with voice commands integrated in a specialized Alexa Skill. Using Alexa Skill, you can manage your Television, Fire TV Stick, Thermostat, Door Locks, Lights, Air Conditioners, etc. The Virtual Assistant and Artificial Intelligence integrated into Amazon’s Alexa are now ready to play a vital role in the enterprises. To make AI behind Alexa more business savvy and to boost the productivity of your business, it is necessary for you to consider Amazon Alexa Skill development seriously. Remember, Alexa is accessible not just through voice-enabled devices, but also from your smartphone. Therefore, using customized Alexa Skills within your own company to let yo0ur employees voice access his/her calendar, conference schedule, Salesforce data on various clients and accounts will get you a competitive edge and to enhance the productivity of your business. The size of your business or the industry is irrelevant to us; we are specialized in developing Alexa Skills that can handle any type of request. Skills that let a user control and query cloud-enabled services and Skills providing original content for a customer’s flash briefing. Do not let your business disappear into the crowd; bring it to the forefront with productive Amazon Alexa Skills. Contact Us for a brief walk-through.